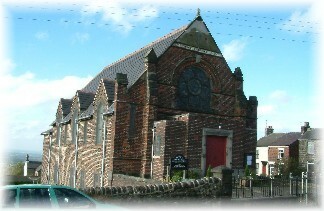 The first Primitive Methodist Chapel was built on Mow Cop was in 1841 just twelve months prior to St Thomas and The Wesleyan Methodist Chapel. It was at first a much smaller building than today and was built just behind the site of the Coronation Mill. By 1857 it was to small for their purposes, and so a larger Chapel was built 100 or yards away next to Pointons Farm. 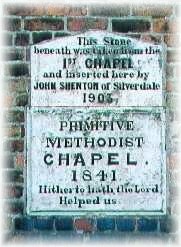 Incidently this is where the Primitive Methodist movement began in 1801. It took three years to build and was ready by 1860. Unfortunately by 1882 it was rebuolt due to storm damage. The original date state from the 1841 Chapel was secured in 1903 and inserted in the side of the new Chapel.